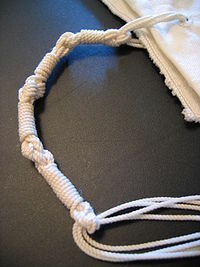 Tzitzit without techelet is tied in four sections with a double knot before and after each section. Between each section one white string is wound around the others. In the first section it is wound 7 times, the next 8 times, then 11 and 13. Altogether there are 5 knots and 39 windings.